Heaton Eye Associates values local teachers and appreciates all that they do for our children and their futures. Teachers change the world because they change lives. They are capable of molding young minds and inspiring greatness in our future leaders. 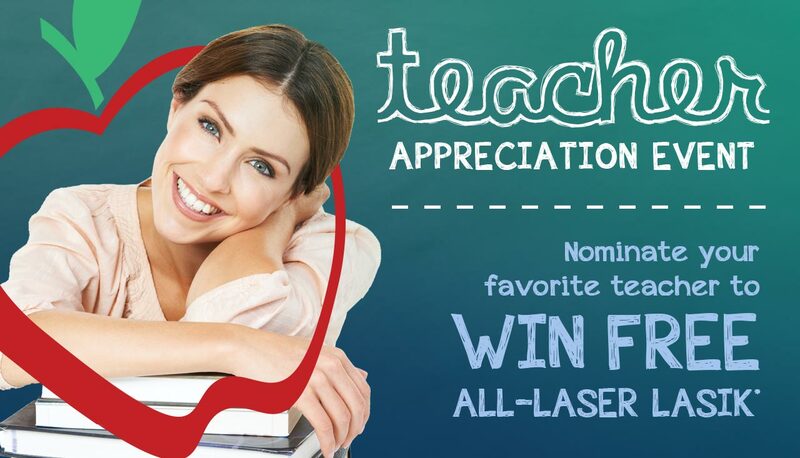 We would like to give back by offering FREE All-Laser LASIK to 2 locally nominated teachers. Do you know an extraordinary teacher who goes above and beyond to make a difference in our students’ lives? Here’s your chance to nominate them for FREE All-Laser LASIK at Heaton Eye Associates! Two local teachers will be chosen for FREE All-Laser LASIK, and all nominees will receive $600 off All-Laser LASIK. Fill out the form below to nominate your favorite teacher and change the way they see the world! *$600 off both eyes All-Laser LASIK regular price for nominee. Winners must be good candidates for LASIK to redeem. Award is non-transferrable. Cannot be redeemed for cash or combined with any other offer or insurance. All nominations must be received by 5/17/19. Visit heatoneye.com for details.